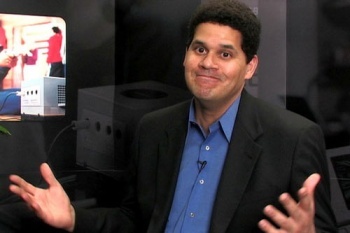 Nintendo of America President Reggie Fils-Aime predicts that in spite of the upcoming release of motion controllers for the Xbox 360 and PlayStation 3, the yawning sales gap between the Wii and everything else will widen even further this year. Sony and Microsoft are counting on big things from Move and Kinect, the motion control systems for the PlayStation 3 and Xbox 360. Success for either could be bad news for Nintendo as it would almost certainly cut into the casual/family demographic that's been the Wii's bread and butter for years, but Fils-Aime doesn't appear the least bit worried by the prospect. In fact, he promised to rain down an ungodly firestorm upon both companies for daring to step out of line. "In terms of where we go in the future, our path is very clear. We want to provide compelling experiences for the consumer. We want to do that in a way that has tremendous value for the consumer and that one-two punch, we believe, is going to continue to drive our business," he said during an E3 investors meeting last week. "The consumer today can get a Wii configuration that has two fantastic pieces of software and a Wii Motion Plus for $199, and the consumer is responding. We believe that the consumer will respond to Metroid: Other M, Wii Party, Kirby's Epic Yarn, Donkey Kong Country Returns, and to all of these fantastic franchises that we're bringing to bear," he continued. "If we continue to execute that, we will continue to widen the gap versus the other home consoles and that is the key because as you drive the installed base... That's how you drive software sales and monetize this business moving forward. We believe that's the right formula." Okay, it's not exactly scorched earth, but the message is clear enough: Nintendo's still got some bullets in the chamber. Kinect and Move may be more technologically advanced but when it comes down to games, Nintendo's lineup is looking pretty solid while the current Kinect catalog looks an awful lot like what Nintendo already brought to the party three years ago.